This delicious gluten and dairy free cake is so easy to make and great with strawberries piled on top for any special day. In a high powered blender blend the eggs, bicarb, olive oil, vanilla, bananas and rice syrup or sweeter. 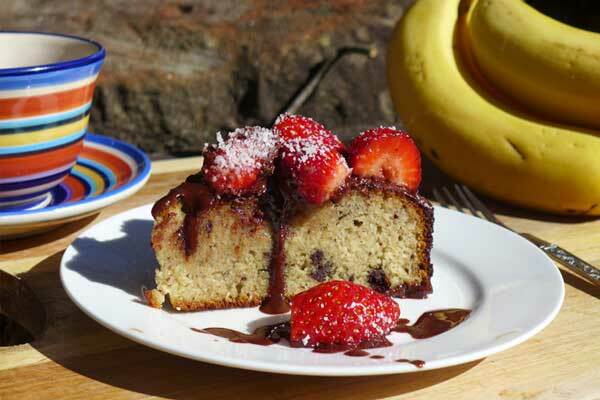 Place the almond meal and cinnamon in a large mixing bowl then pour in the banana, egg blend. Roughly chop up 1 block of chocolate using a large flat knife so it is in a variety of shapes and sizes..not too big, some crumbly. Place in a 18 inch spring form round cake tin and bake for 40-45 mins. Leave to completely cool before icing. When your cake has cooled transfer it to a wide plate. Melt the chocolate in a bowl over a saucepan of boiling water or use a double boiler. When melted add the coconut oil and sweetener. Thoroughly combine and cool to near room temp. Spread over cake and let drip down the sides. Put in the fridge for about half an hour before decorating with your favourite fruit and sprinkles of desiccated coconut.